A friend of mine sent this to me. Funny! 1. Pick up cat and cradle it in the crook of your left arm as if holding a baby. Position right forefinger and thumb on each side of cat's mouth and gently apply pressure to cheeks while holding pill in right hand. As cat opens mouth, pop pill into mouth. Allow cat to close mouth and swallow. 2. Retrieve pill from floor and cat from behind sofa. Cradle cat gently in left arm and repeat process. 3. Retrieve cat from bedroom, pick up and throw soggy pill away. 4. Take new pill from foil wrap, cradle cat in left arm, holding rear paws tightly with left hand. Force jaws open and push pill to back of mouth with right forefinger. Hold mouth shut for count of ten. 5. Retrieve pill from goldfish bowl and cat from top of wardrobe. Call spouse in from garden. 6. Kneel on floor with cat wedged firmly between knees, hold front and rear paws. Ignore low growls emitted by cat. Get spouse to hold head firmly with one hand while forcing wooden ruler into cat's mouth. Drop pill down ruler and rub cat's throat vigorously. 7. Retrieve cat from curtain rail, get another pill out of foil wrap. Make note to buy new ruler and repair curtains. Carefully sweep up shattered figurines and vases from hearth and set on one side for gluing later. 8. Wrap cat in large towel and get spouse to lie on cat with head just visible from below armpit. Put pill in end of drinking straw, force mouth open with a pencil and blow into drinking straw. 10. Retrieve cat from neighbor’s shed. Get another pill. Place cat in cupboard and close door just enough so that head is showing. Force mouth open with dessert spoon. Flick pill down throat with plastic band. 11. Fetch screwdriver from garage and put cupboard door back on hinges. Apply cold compress to cheek and check records for date of last tetanus shot. Throw t-shirt away and fetch new one from bedroom. 12. Call fire department to retrieve cat from tree across road. Apologize to neighbor who crashed into fence while swerving to avoid cat. Take last pill from foil wrap. 13. Tie cat's front paws to rear paws with garden twine and bind tightly to leg of dining table. Find heavy duty pruning gloves from shed. Push pill into mouth followed by a large piece of fillet steak. Hold head vertically and pour 2 pints of water down throat to wash pill down. 14. Get spouse to drive you to emergency room. Sit quietly while doctor stitches fingers and forearms and removes pill from right eye. Call furniture shop on way home and order new dining table. 15. Arrange for ASPCA to collect cat and contact local pet shop to see if they have any hamsters. What would I suggest? Tequila!!!! Poor cat-- I mean you. 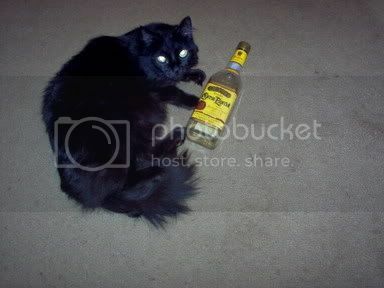 When my cat needed medication I would ask for the liquid. I put drops of it on his body, not his paw because that would be to easy to shake off, he'd have to lick it off. I knew he was not happy with me but it did work! Bienvenidos al 100th Carnival de los Gatos! We had over 50 submissions. Enjoy all the links along with some Feline Facts and early Carnival Flashbacks at Bloggin' Outloud. joann, that sounds like a better choice. easier on everyone and everycat!